It is with great sadness that we announce the passing of Edna Taylor. 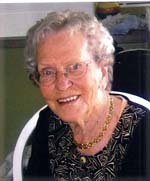 Edna passed away peacefully in the presence of her dear friend Dawn and Chaplain Bill on April 10, 2012 at Hillcrest Village in Salmon Arm. Edna is predeceased by her son Donny Killian, husband Paul Killian and second husband Orville Taylor, also brother Roy Milligan and sister Doris Burr. Edna is survived by her sister Freda Chernos of Calgary, brother Mac Milligan of Bowden, sister Joyce Fletcher of Toronto and many nieces and nephews. Edna was the Post Mistress at Delia for many years. After retiring she moved to the Shuswap Valley where she met and married Orville Taylor. Edna had many friends and was loved by all and she had a terrific sense of humor. Edna was well known for all her beautiful quilts, she also loved knitting, sewing and tatting and was an avid bridge player. Our family would like to express our gratitude to Dawn and George Doyle for all of their wonderful love, care and support which they gave Edna over the years. Edna spent the last years of her life being cared for by the wonderful staff at Hillcrest Village, Cottage 2. Special thanks to Dr. Goldberg and Chaplain Bill for their caring and compassion. Edna lived her life to the fullest and will be missed. Edna has requested that there will be no funeral and that her ashes be scattered at Delia, Alberta.